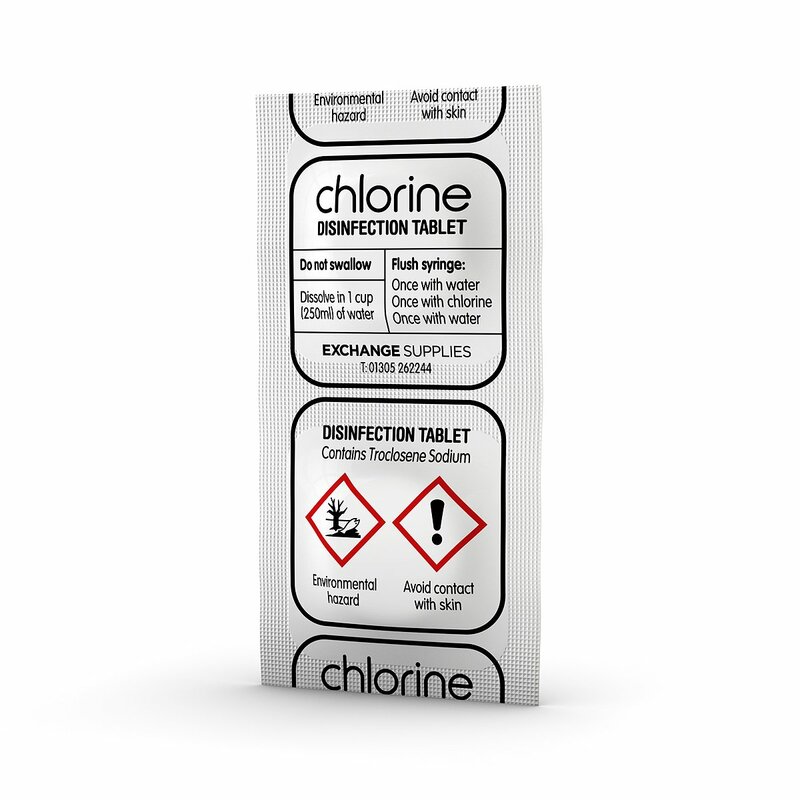 Chlorine disinfection tablets are an inexpensive, discrete, safe, and highly portable alternative to thin bleach that can be distributed to increase the frequency and effectiveness of syringe cleaning. Cleaning syringes doesn't offer a guarantee of safety, but it greatly reduces risk, and if all injectors who reuse injecting equipment did it routinely there would be a massive reduction in blood borne virus incidence. 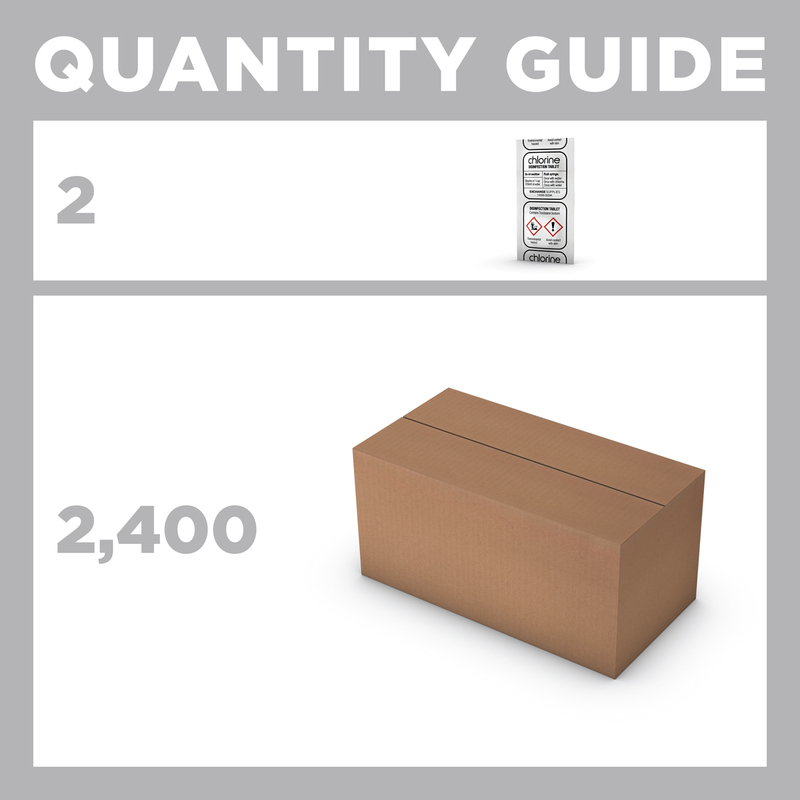 Chlorine tablets come in small boxes of 2,400 tablets (1,200 strips of 2) – although we can split boxes to meet your exact requirements if necessary. 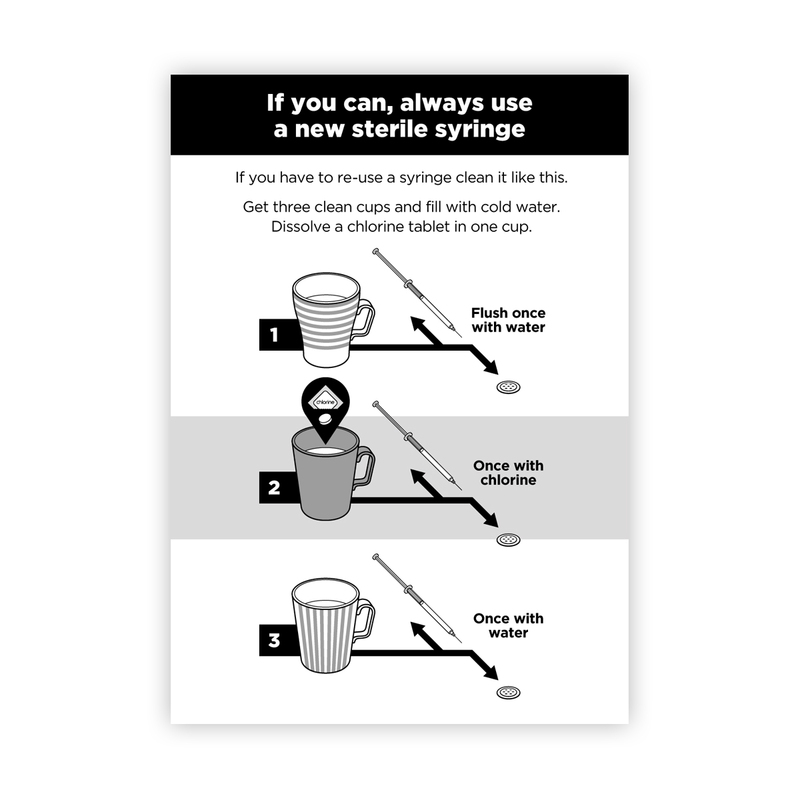 We think that needle and syringe programmes should give at least one strip of two tablets per transaction in order to ensure that injectors have enough to be able to disinfect used syringes whenever they need to. Of course, as part of the transaction, injectors should be advised to never re-use injecting equipment, and that cleaning can never provide an absolute guarantee of protection from infection. However, distributing the tablets enables NSP workers to easily open a dialogue about disinfection of equipment and gives injectors the opportunity to have the means to disinfect previously used equipment with them at all times, which will greatly reduce the risk of syringe reuse. We are all working towards all illicit drug injections being administered with sterile equipment but this is a huge task, and re-use of syringes remains common. At current distribution levels every syringe issued is used an average of 3 times, making workable strategies to encourage disinfection vital in the fight against the spread of BBV’s and bacterial infections. In a perfect world all syringes used by drug injectors would previously unused and therefore sterile. But, we should never allow the ‘perfect to be the enemy of the good’ and harm reduction is about using pragmatic strategies to ensure the best possible outcomes for drug users in the UK. We would recommend that 2 tablets are offered at every transaction, so that injecting drug users have access to the equipment they (or their friends) need to clean syringes at all times. The individual effervescent Chlorine Tablets are based on what is known as a a dry chlorine donor, sodium dichloroisocyanurate (NaDCC). The NaDCC is blended with effervescent components (which ensure it dissolves quickly in water) before being compressed into tablets and put in individual sachets. The result is a fast-dissolving, highly convenient, and accurate alternative to liquid bleach. Our chlorine tablets are produced exclusively for us in the UK, by a fully accredited and licenced Medicines Manufacturer. The dose is carefully controlled, and each tablet contains the 1 gram of the active ingredient: Sodium Dichloroisocyanurate Anhydrous, this chemical is also known as Troclosene Sodium and NaDCC. This produces a disinfectant solution of 1,000 parts per million when mixed with 1 mug (250ml) water. remain stable for 5 years or more. We have produced a short youtube video for the Harm Reduction Works Campaign, in which Professor Robert Heimer of Yale University explains the science behind bleaching syringes... to watch it, click HERE. On the practice notes and FAQ pages we aim to give you the information you need to use our products as safely as possible. If you have any further questions or would like to discuss an issue with us, we are always happy to provide support, information and advice to users of our products – full contact details are in the about us section. The tablets are very easy to use. Clear and simple instructions are provided on the wrapper. The water should be clean, not having been previously in contact with any used injecting equipment, and either in 2 separate containers or drawn up from the stream from a tap. To see the video with this method shown using thin bleach click HERE (youtube video opens in a new window). Q: I work in a needle and syringe programme, how many tablets should I give out with each transaction? At least one pack of two tablets per transaction will ensure that injectors can choose to disinfect used syringes in most situations they encounter. Q: Does giving out chlorine tablets encourage people to reuse syringes? No! In most circumstances, the person would probably have still chosen to re-use the syringe, but would not have had the ability to disinfect it prior to re-use. Q: Why not just give out more syringes? You should do that as well! One of the reasons that we know syringes must be being re-used is because even on conservative estimates, we only distribute enough syringes for about one third of all the injections that take place. Increasing the number of syringes distributed will have some effect on the need to re-use, but it is likely that to achieve a situation where no-one ever feels the need to re-use would require a 4-5 fold increase in distribution. Q: Who should be targeted? Anyone who injects, or anyone who knows someone who injects. The chlorine tablets are cheap, discrete and portable. Everyone who injects should have easy access to them. Q: Are there any videos that show exactly how to do it? There’s a video we made for the Harm Reduction Works campaigns showing how to effectively disinfect a syringe using thin household bleach. The technique when using chlorine tablets is exactly the same (apart from having to dissolve the tablet in water first). To watch it click HERE. Q:Is bleaching syringes risk free? No. It’s always better to use a new sterile syringe. However, in situations where a sterile syringe is not available, bleaching represents the best available alternative. What we can say, is that if the syringe is rinsed with water after the bleach, there is no risk from the bleach. Q: Needle & syringe programmes have been around for 25 years, why have we not been told to encourage bleaching before? Advice to clean syringes was not widely given when we didn't know for sure that it would kill the virus. The field was excercising the 'precautionary principle' and so published cleaning advice we knew – in the real world - would rarely if ever be followed (hence it wasn't given prominence, or even given at all). This was because we were worried about giving advice that might not be reliable. Before we published the advice in the harm reduction works campaign, and sourced these chlorine tablets we consulted widely on whether we should move to change the cleaning advice based on the findings at Yale. Yale is one of the world's leading universities, and Robert Heimer's team has a long and distinguished record in the field, so we should take their findings seriously, especially given that we're in the midst of very high levels of HCV incidence, and (complex) cleaning messages to date appear to have had little effect. are concerned that a perception of inevitability of infection is a real problem, that is exacerbated by talk of soaking in bleach. As the method is proven against HIV, after the essential caveat that a new syringe is always better, at the very least published resources for drug users should show the 1x1x1 method and say that this does kill HIV. We think that by changing the advice to something more manageable, accessible and likely to be done, there is a real chance to prevent a lot of HCV infections. Q; Can traces of chlorine bleach left in a syringe after flushing with water cause physical problems? No! When a syringe is flushed out with water after flushing with bleach, only microscopic traces of bleach will remain and these will cause no health problems. Why don't you recommend making the solution stronger - with less water? Although in principle overdosing might seem a reasonable step to take, the European Authorities approach regarding the use of biocides, through the Biocidal Product Regulation (BPR), is to reduce their use to the lowest concentration required to achieve biocidal efficacy. All the new microbiological tests are now being tailored in this manner. In order to identify the lowest concentration a product has to be tested at three different concentrations. Two of them have to pass the test and one fail. The lowest of the two that have passed the test becomes the recommended dose. Overdosing opposes this approach so we can't recommend it. However, if people do make the solution stronger, it may lead to greater viricidal effect.